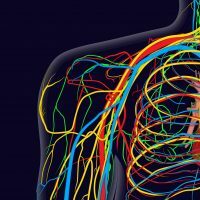 The peripheral nervous system, which is derived from the spinal cord and branches to form hundreds and thousands of nerve fibers, is what allows for the movement and sensation in our bodies. In our upper limbs, for example, the sensory and motor functions are made possible thanks to the activity of a large group of nerves that come out of the upper part of the spinal cord and send nerve fibers through the neck and underarm along the entire length of the arm. This group of nerves is known as the brachial plexus and damage to it, which can be caused by a number of factors, can result in severe disability in terms of movement of the affected arm, even resulting in paralysis. Prof. Shimon Rochkind is one of the senior physicians at the Neurosurgical Center for Excellence at the Herzliya Medical Center – he is a world-renowned specialist in the treatment of conditions in the peripheral nervous system, with particular expertise in the treatment of brachial plexus injuries. As mentioned previously, the brachial plexus is a group of nerves that runs from the upper spinal cord to most parts of the upper limbs. One of the major parts of the system, a junction of sorts in which all of the nerves of the plexus meet, is located at the upper part of the shoulder adjacent to the collarbone. This location exposes these nerves and renders them vulnerable. It is well known that the nerves of the body are highly sensitive to pressure, excessive direct force and external trauma, which can sever nerves, whether partially or completely. This situation can disrupt the sensory and motor functions controlled by the nerves, even resulting in paralysis. Diagnosis of damage to the brachial plexus is performed using a series of neurological tests and electromyography (EMG) as well as a nerve conduction study (NCT), which allows for determination of the location and severity of the damage. In certain instances, an MRI scan may be necessary as well. In addition, it is important to remember that damage to the brachial plexus can be caused to infants quite frequently during labor and is therefore also known as “birth palsy”. It is defined as damage that results from pulling the baby out by force, particularly in cases during which the labor is a difficult one and when medical intervention is necessary. Pulling the baby by their arm, in an effort to help release them from the birth canal, can apply stress to the shoulder region and cause significant damage to the nerves of the brachial plexus. Prof. Rochkind’s extensive experience in the treatment of brachial plexus injuries, both among adults and infants, allows for optimal care and recovery, all of which of course depends on the severity of the damage. When is an operation necessary to repair the brachial plexus? There is a wide range of severity when it comes to damage to the brachial plexus, beginning with minimal limitation of movement and sensory function of the hand all the way up to complete paralysis. When the damage is relatively minor, conservative treatment is preferred, including physical therapy and rehabilitative treatments of the muscles and of the damaged nerves. If the damage to the brachial plexus is significant and severe, the only treatment option is neurosurgical intervention. Note that the decision regarding whether or not to operate is typically made 2-4 months after the initial injury occurs. If some improvement in the condition does not occur during that period, that is, if the body does not succeed in rehabilitating itself naturally, surgery for repair of the brachial plexus should be considered. During the operation, damaged nerves are released in order to restore their ability to properly transmit electrical signals from the brain and to allow conditions for improved function of the arm. In the event that there is a neuroma (a mass of scar tissue) in the brachial plexus, the repair of the brachial plexus is performed using a nerve graft taken from the area of the lower leg. The operation for the restoration of the brachial plexus is a microsurgical procedure performed only by specialists with extensive experience in these kinds of injuries, specialists like Prof. Rochkind. Prof. Rochkind has performed a long line of such surgeries for the repair of the brachial plexus. The use a surgical microscope and other advanced surgical instruments facilitates achievement of the best possible results. Are you or your child suffering from neurological brachial plexus injury? Contact us today at the Neurosurgical Center for Excellence at the private Herzliya Medical Center, one of the leading facilities in the world in its field.